Our tour of Sport Ngin’s best club soccer sites took us to the Eiffel Tower, gave us a front row seat to the amazing “Comeback in Cobeja” and had us brushing up on our German and Spanish. Talk about a wild ride. The competition was so close in this rankings category we went beyond the usual emphasis on content, design and navigation and also assigned points for the best team pages, about/history information, coach and staff pages, recruiting and alumni information and photos and video. And still there were mere fractions separating many of the top sites. In the end, we always lean toward the sites with the best content, and that means frequent news updates, deep and detailed historical sections, unexpected videos (we saw an impressive juggling exhibition) and meaningful articles (we read a touching tribute to a deceased player). Location: Illinois' Fox Valley area. 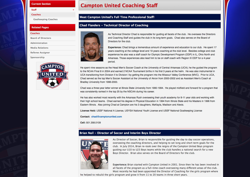 Campton United Soccer Club was founded in 1986 and is based out of St. Charles, Ill., about 40 miles west of downtown Chicago. The club’s 22,000 square foot indoor training facility opened in December of 2010. Where to start? The striking red, white and blue design has a distinctive, new-age look. There’s a clear hierarchy of news, upcoming events and social media widgets on the home page, which devotes room to call out sponsors at the bottom without forcing viewers to scroll for miles and miles. 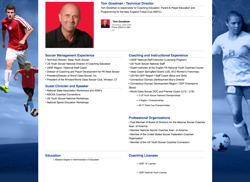 The Coaches page is filled out with headshots and bios, including a Licenses Held section for each coach. A table on the College Commitments page lists information dating back to 2007. A random sampling of team pages shows a consistent layout that leads with team information, follows with calendar information and includes a news aggregator at the bottom. 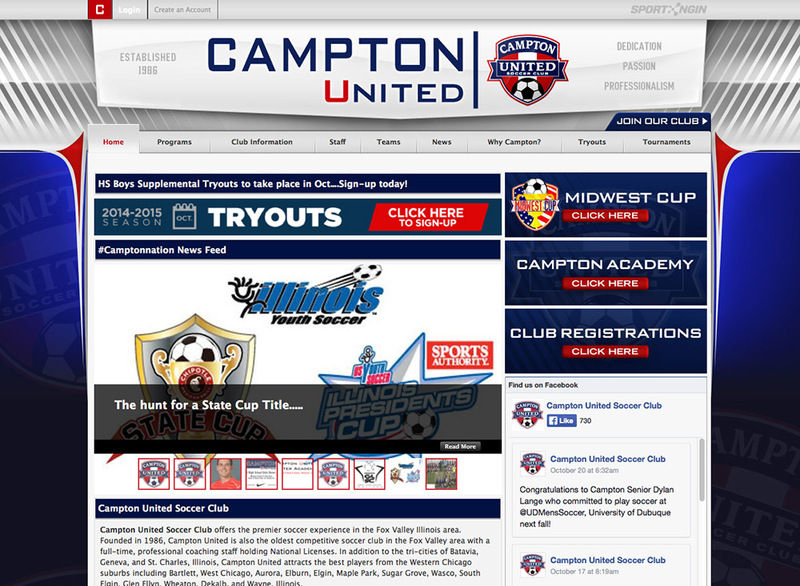 The three graphics in the upper right of the home page (Midwest Cup, Campton Academy and Club Registrations) serve as high profile supplements to the top navigation. Additional custom links include the Join Our Club button just above the top nav and the Tryouts sign up above the news slideshow are deftly positioned. Futsal is an indoor version of football (soccer in U.S. terminology) that uses a slightly smaller and heavier ball. Futsal teams have five players, including the goalkeepers. Futsal is part of Campton’s winter training routine. The Juggling Club page includes tables that showcase the members most devoted to working on their footwork, including the handful who have reached the rarified air of the 1,000 Club. Another unexpected surprise is the video at the bottom of the page that shows a mesmerizing exhibition of juggling. 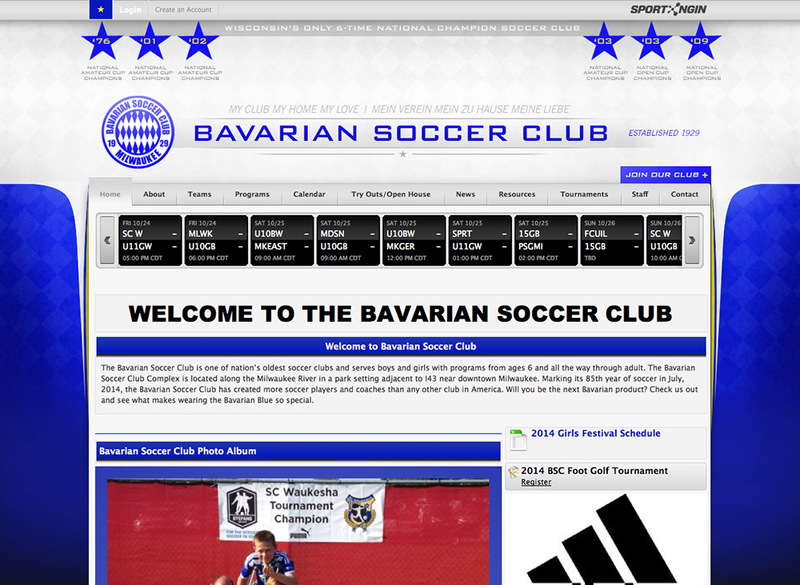 The Bavarian Soccer Club, which celebrated its 85th year in July, is based in Milwaukee. The club’s soccer complex is located on the Milwaukee River, adjacent to Interstate-43 near downtown. The homepage has a clean, striking design similar to that of No. 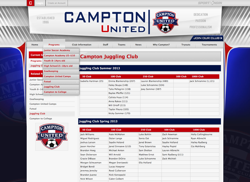 1-ranked Campton United. Some of the text in the banner, written in German, serves as a call out to the club’s home-country heritage. The welcome text at the top of the homepage does a great job of highlighting club’s history. The club gets high marks for tracking schedules and scores for its teams, as highlighted in the scroller at the top of the home page. And we love the “Comeback and Cobeja” video at the bottom of the homepage. The Coach Bios page is well organized, and we like that most of the coach photos were taken with the same club backdrop and with the coaches wearing a blue club shirt. We haven’t seen alumni/recruiting information labeled Successful Players previously, but the page is updated with Class of 2014 college signings as well alumni who are coaching prominent teams. The design and information on the team pages vary, but most have rosters with mugshots and schedules, a rarity in this rankings category. The sub-categories from the top navigation allow for quick scanning of page categories. Former Bavarian member Jimmy Banks played for the U.S. in the 1990 World Cup. 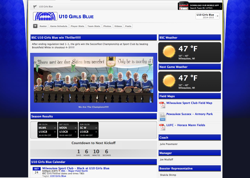 The Booster Club page includes a Flash player that displays current and back issues of the club’s magazine-style newsletter. 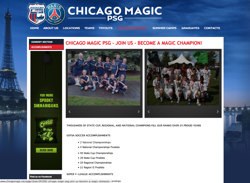 The Sports Club became the Chicago Magic Soccer Club in 1989 and has training sites throughout the Chicago area. 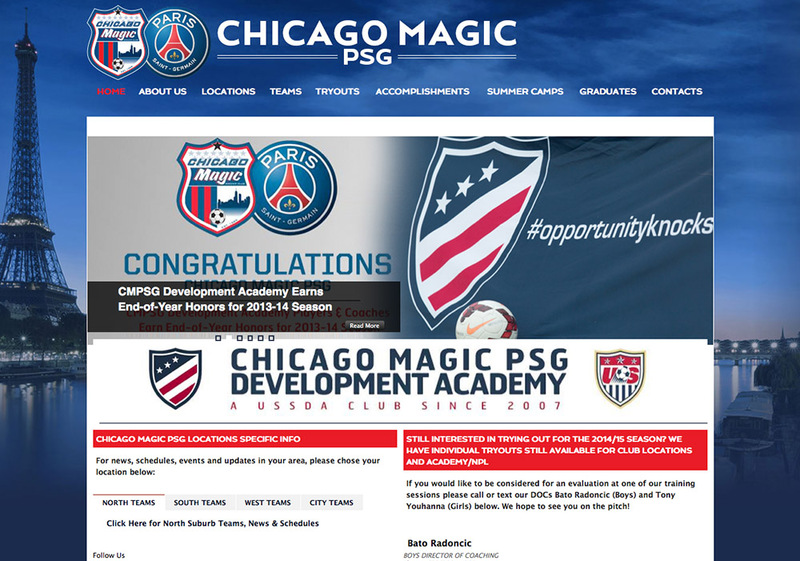 It partnered with Paris Saint-Germain in 2011, and joint activities between the clubs include training seminars and clinics in the U.S.
Any site that has the Eiffel Tower elegantly placed in the background deserves high marks, and the gorgeous home page design is just a taste of the strong design elements sprinkled throughout the site, especially on the landing pages for each of the categories in the top navigation. The Coaching Staff page is well organized includes photos and lists of accomplishments. College commits and Magic PSG players in the professional ranks can be found under the Graduates link in the top navigation. We didn't see roster or schedule information on the team pages we sampled. The top navigation isn’t flooded with links, and the left subnavigation is used wisely to list out the site’s depth of content once you click into the main categories. Chicago Magic PSG’s Andrew Putna and Abuchi Obinwa traveled to Paris in February of 2013 for a week of training with Paris Saint-Germain. 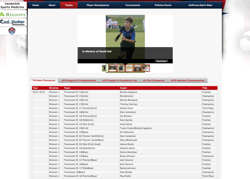 The Accomplishments page lists all the national, regional and state championships won in tournaments sanctioned by multiple national governing bodies. Slideshows filled mostly with team photos help dress up the page. 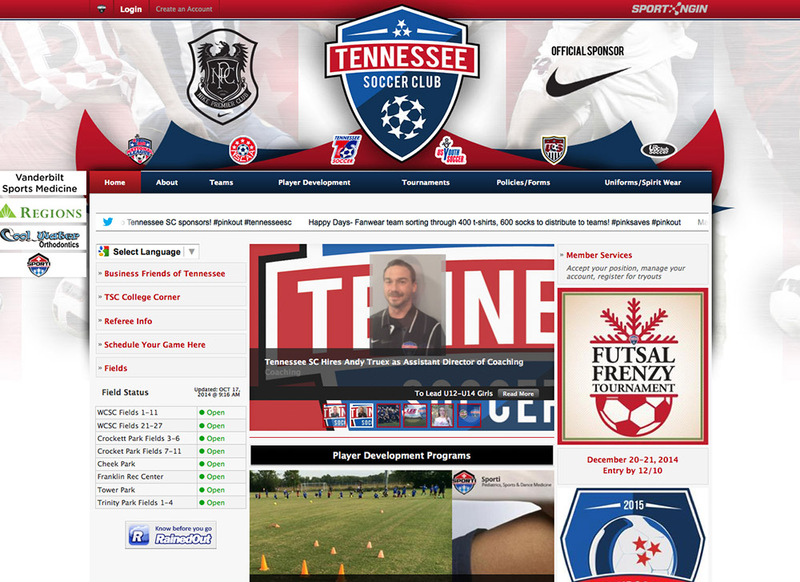 The Tennessee Soccer Club was founded in 2012 after the merger of the Brentwood Soccer Club (founded in 1985) and Tennessee Futbol Club (founded in 1999). The club has about 120 boys and girls teams ranging in age from Under-8 to Under-18. The club’s main playing facilities are located in Brentwood and Franklin. News items, player development programs updates, photo galleries, videos, field status information, an events calendar and social media widgets – everything but the kitchen sink – appears on the home page. That’s a lot of content, but it is organized and updated regularly. Worthy of noting is the Google translate code added to the page which allows viewers to switch between English and Spanish – first time we’ve seen that used. Pages are devoted to every coach in the program and most of them are filled out with photos and coaching license, coaching experience, playing experience and personal information. Separate tables are built for boys and girls alumni who have gone on to play in college and the lists date back to as far as 1998. Several team pages have rosters loaded with player photos and schedule information with final scores. Standard options appear in the top navigation, and there are more links in the left and right rails on the home page. Soccer players do not go into hibernation in the winter months. 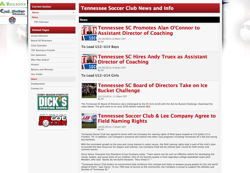 On the contrary, the Tennessee Soccer Club hosts a Winter Indoor Series with sessions starting in early January and running until late February. The History of Champions page is topped by a touching tribute to David Ooi, a young club member who passed away on July 20, 2014 after a long battle with a brain tumor. Location: Massachusetts and the Providence, Rhode Island area. The massive New England Futbol Club, founded in 1992, is the offspring of multiple mergers over the years. It has more than 1,500 players. The minimalist home page design. Prime real estate is devoted to the video of the club’s girls’ U-14 national championship team. The club’s affiliations are presented at the bottom of the home page. Staff and coach pages have a unique design, quality photos and multiple layers of information making them among the best in this rankings category. We couldn’t find a list of the club’s college recruits, although there is an Alumni page that features a prominent former male and female player. Many of the team pages we sampled had team photos but no roster or schedule information. The home page basically serves as a hub of links presented in the top navigation, a sub navigation with three large buttons and left rail with four additional links. Plenty of options to get viewers where they needed to go. The club’s girls’ Under-14 team won U.S. Club Soccer and U.S. Youth Soccer national championships this year. 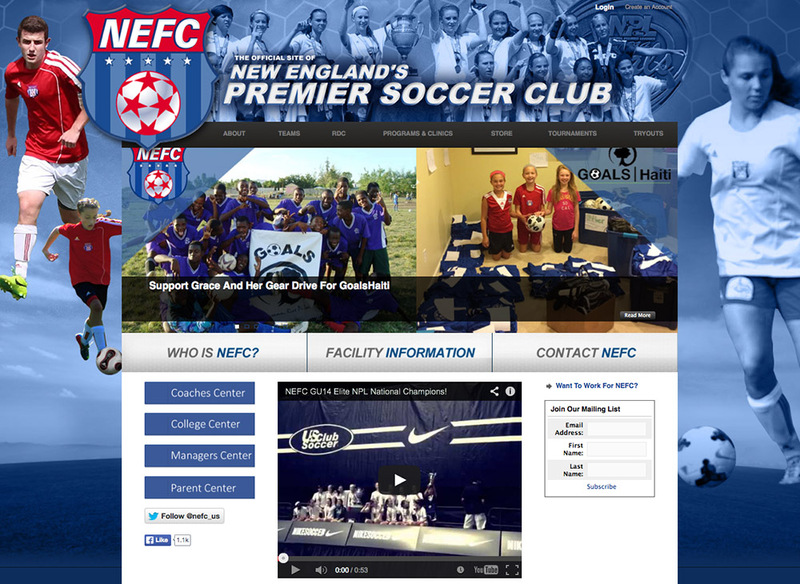 Click the Who is NEFC? link on the home page and, surprise, there’s a video that explains the club’s structure and touches on several other topics including coaches, curriculum, programming and competition. Here are more outstanding sites that were in the final judging mix but didn't crack the Top 5. Wondering why your site didn't make the list? Want to put your site in the Top 5? Contact loren.nelson@sportsengine.com for a free consultation. Loren Nelson is Community Manager at SportsEngine. He is also the National Media Editor and has served in a variety of other customer facing and media roles since 2009.